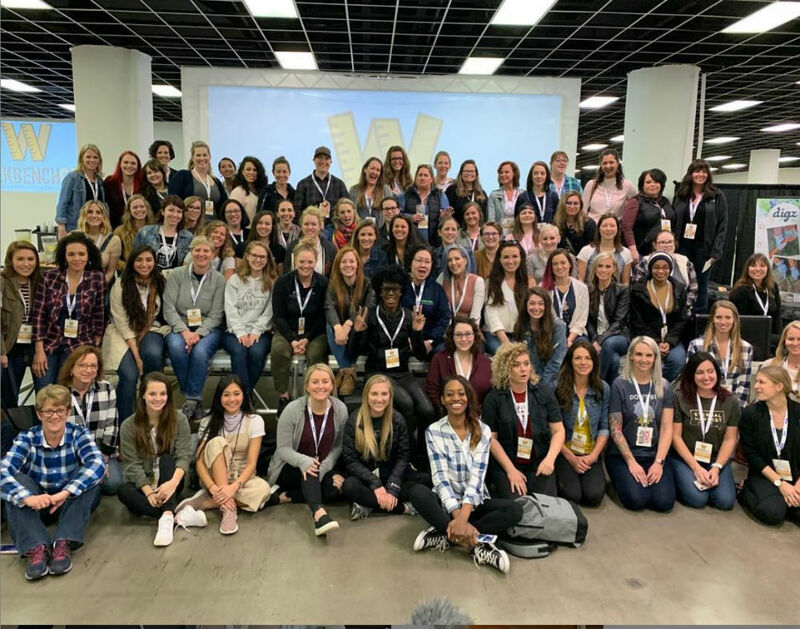 Editor's Note: We are excited to be bringing back our Women in Woodworking column to Wood News Online with our new contributor, Char Miller-King. Char is a regular customer here at our store in Atlanta and we featured her on our Highland Woodworking blog in September 2017. 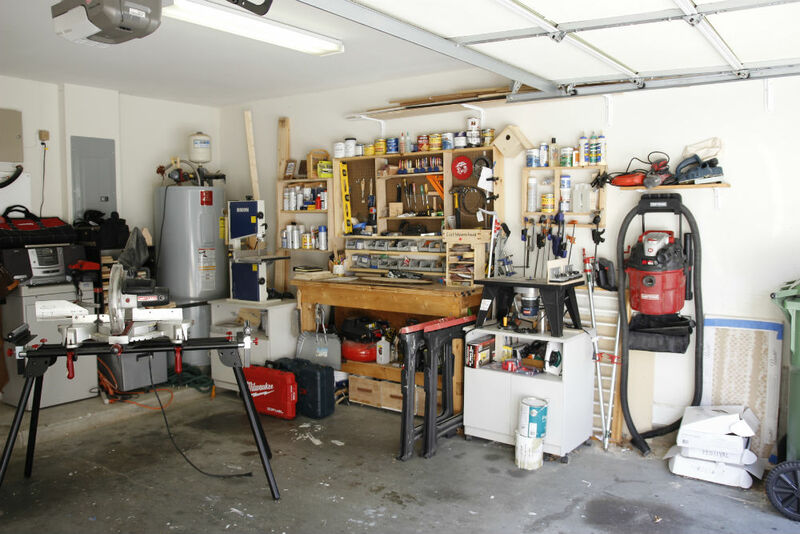 Welcome to my corner of the world, my garage shop! About 16 years ago I started building furniture I needed as a hobby. Like many others new to woodworking, it all started with a bed. With little knowledge and a battery powered screwdriver I built a platform bed. From that point on I was hooked on making anything I could for my family and I. 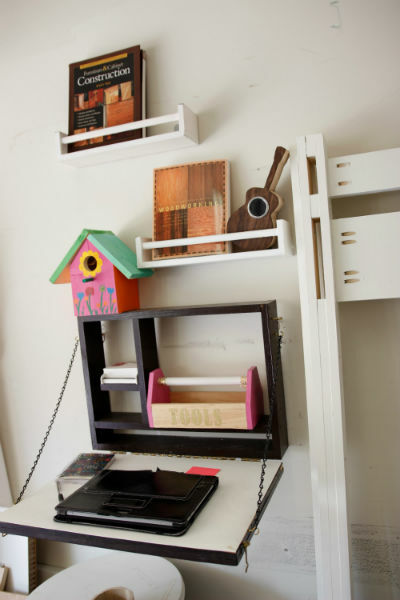 There were a few bookcases and desks made along the way and soon my tool arsenal began to grow. Instead of purchasing the latest handbag or name brand dress, my time and money went to researching the best new tool and then buying it. My shop is in our two-car garage, which at one point we could fit two cars and now on a good day we can fit one. My tools started encroaching on the space designated for our vehicles. My Crafstman Compound Miter Saw is my most used tool and sits on a dedicated miter saw stand. It takes up a lot of floor space in the shop, I typically leave it near the garage door to allow most of the sawdust to escape. The hub of my shop has always been the workbench I made several years ago. It's extremely sturdy and heavy. Recently, I put it on casters to make my shop more mobile. 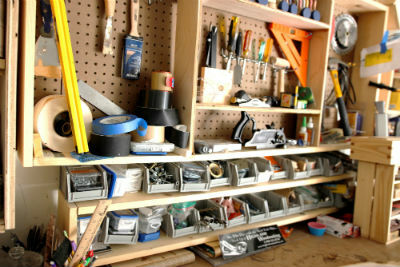 Above my workbench are storage shelves and an open cabinet made from scrap pine, plywood, and peg board. The tools I use most are displayed for easy access. I placed all my screws, nails, and drill bits in small plastic bins for easy access. Some of the other items that are often used include my level and different types of tape. I use paint tape to hold my glue-ups together, if I do not have enough clamps, and chalkboard tape to label items such as custom tap handles I made for a deluxe lemonade stand. Gaffers tape even has its place too, it's great for securing dust collection hoses in a pinch. One of the most important things on my workbench is my first aid kit. It's actually the sliding top box I made a few years ago in the Fundamentals of Woodworking class at Highland Woodworking. 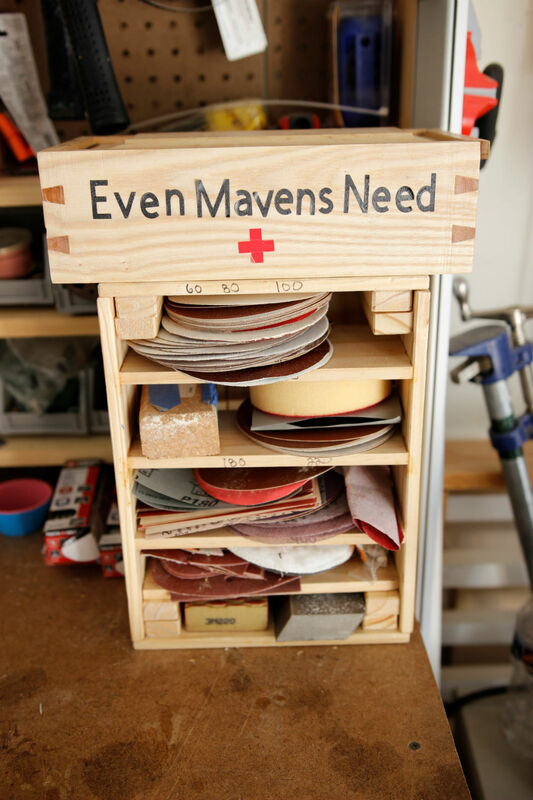 I added a few interlocking slots and keep it stocked with band aids for minor cuts. Storage space is always an issue in any home shop, so I utilize every nook and cranny to keep items organized and easy to find. Underneath my workbench I made three rolling drawers with scrap wood from a few beds I made and used pen blanks for the handles. In my drawers I keep paint and stain supplies and small cut offs of exotic scrap wood. Right above the drawers, I keep two of my drills and both circular saws. My chainsaw lives there also, which comes in handy after a storm when there are fallen trees around. 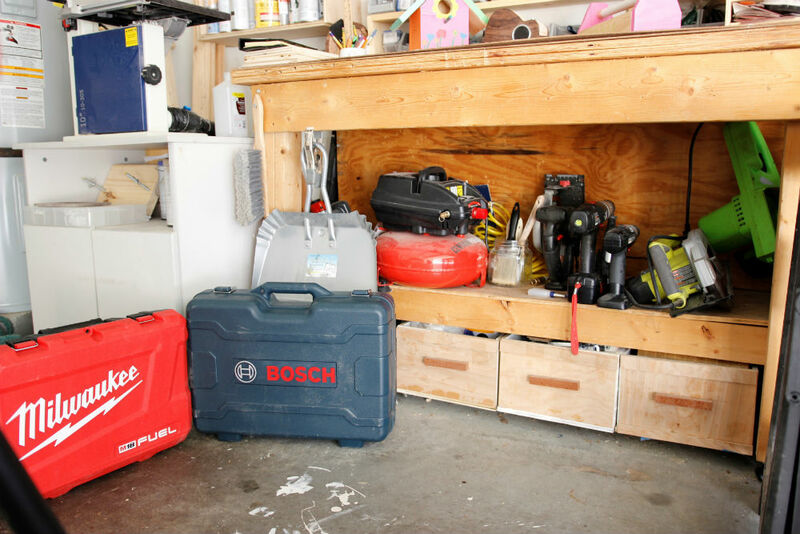 Since I don't have a great dust collection system yet, I keep my newer tools like my Bosch Plunge Router in the case to keep them dust free. When I am doing anything that produces excessive sawdust, I work with the garage door open and place an air filter on the back of my box fan. My Rikon Bandsaw and Ryobi Router Table are also mobile, sitting atop office cabinets that were repurposed and are great for storing items underneath and out of site. 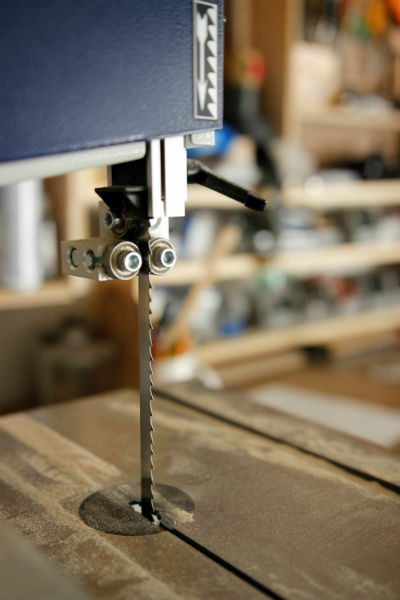 The bandsaw sees a lot of resawing projects and is outfitted with a Wood Slicer Bandsaw Blade which can rip through almost anything I put on the table. I have the 10" version of the Rikon, and for a small shop it gets the job done. A few months after joining Instagram, my hobby started to turn into a business and that's when Wooden Maven, Inc. was birthed. With more projects came more scrap wood as well as a need to extend my operation to the other side of the garage. I added a standing desk to the wall in order to have a place to work on my woodworking plans. I also keep some of my books here to refer back to while I'm working. Over the years, I have attended many classes and joined woodworking groups in and around Atlanta. Typically, I am the only woman present. I never felt out of place as everyone in attendance had a shared passion for making. However, I did wonder why fewer women were involved in woodworking. It can be a grueling hobby and career, its dusty, it's brutal on your hands, and fine woodworking is a serious investment of time. About a year ago I started searching for other women in woodworking to connect with and I found a few on social media and they were amazing. When we connected it was like being a part of a sister circle, I had finally found my tribe. There is almost nothing better than talking shop with someone, but talking shop with another woman is extraordinary, you know that you are speaking with someone who truly gets you. 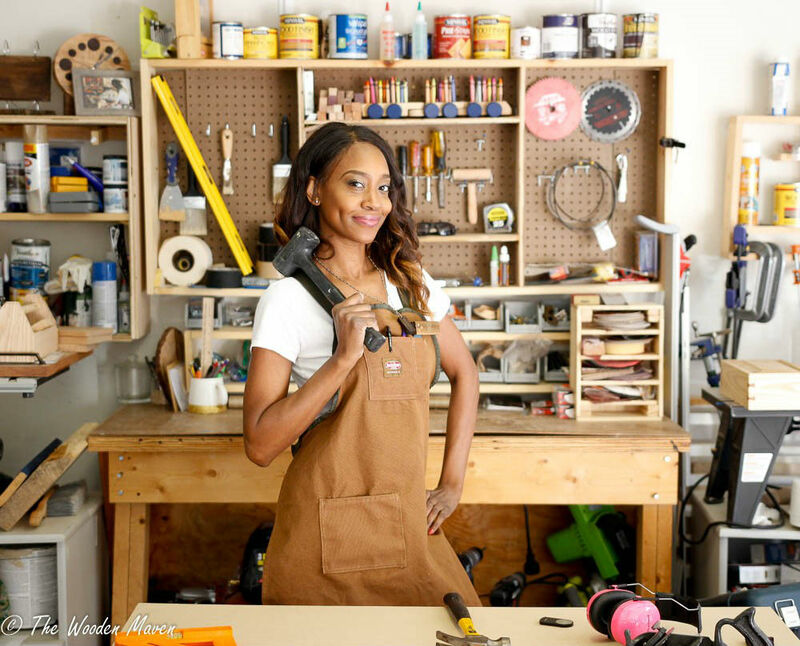 I wanted to explore this phenomenon of women in woodworking. During March of 2019, I ventured to Workbenchcon, where all the who's who in the woodworking world would be. It was nothing short of a mind blowing experience. 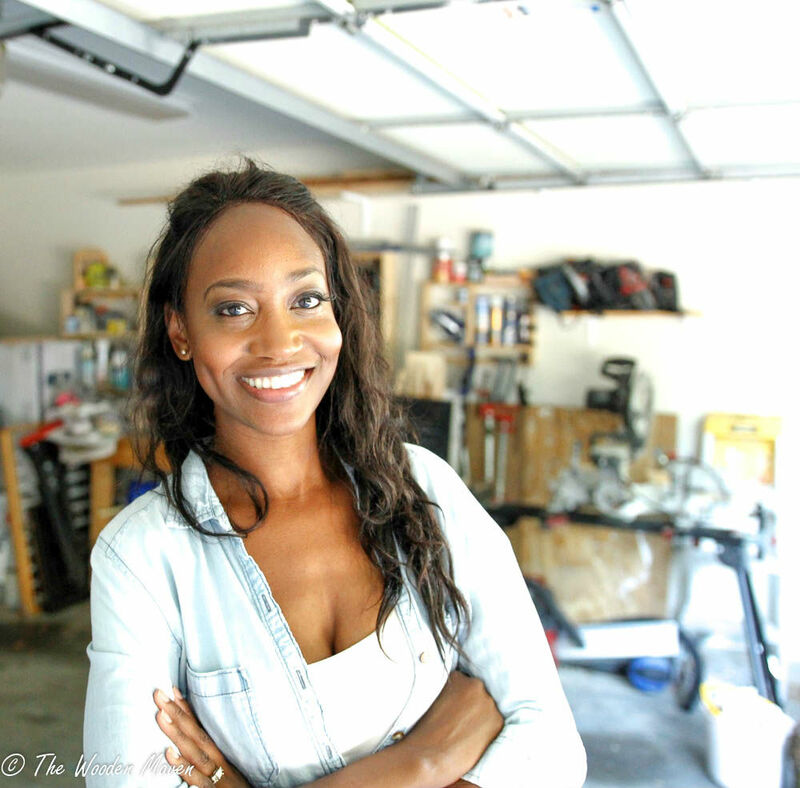 I soon began to engage more into social media, not only being proud to be a maker, but a woman, and a mother. Sharing all the aspects that make me who I am was inspiring to others and that is when I knew I was on to something; there was always a part of me that wanted to share what I know with as many people as possible and inspire others to follow their dreams. Even if that meant going off the typical path that society tells us we should take. 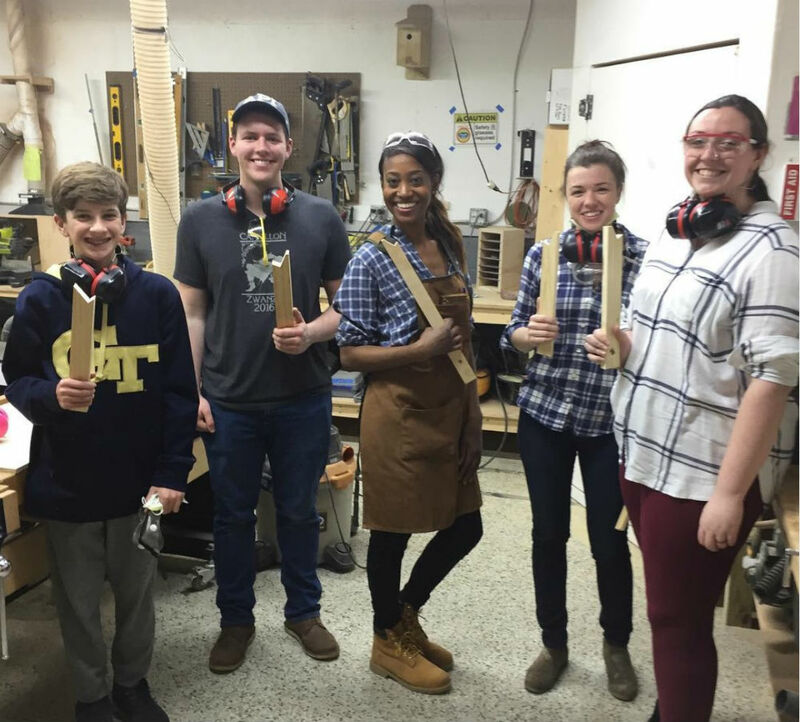 My path led me to teach woodshop classes especially designed for kids, as well as introductory woodshop classes to adults at Decatur Makers, a local makerspace. 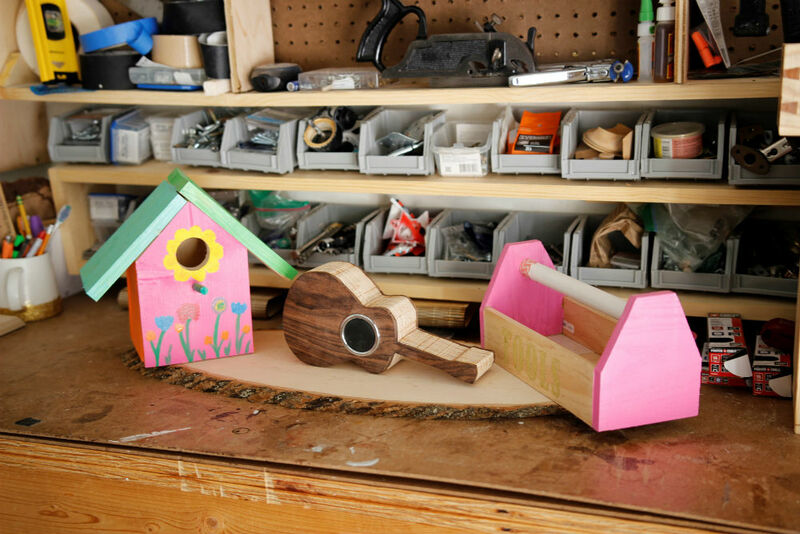 Having the opportunity to introduce children and adults to the wonderful world of making is an honor. If the word "wood" is anywhere in a sentence, I want to be involved because I know with each interaction I have that is an opportunity to empower people, especially women to roll up their sleeves, join the boys club, and cut some wood. 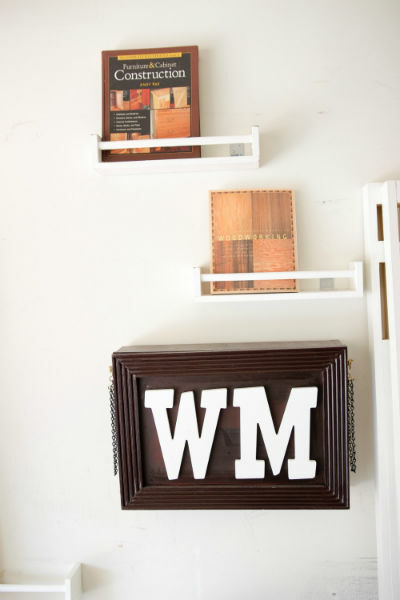 You can check out Char's website at https://www.thewoodenmaven.com/ and follow her on Instagram at @woodenmaven.